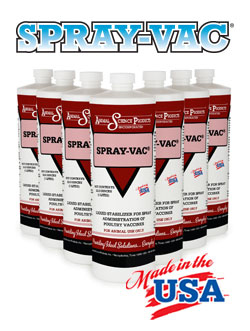 Spray-Vac® provides the ultimate protection for spray vaccination. 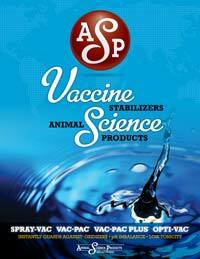 Spray-Vac® aids in the administration of sprayed vaccines for poultry. It is especially designed to prolong the viability and improve the effectiveness of reconstituted and diluted spray vaccines. Pink dye to indicate the spray solution is completely safe and ready to receive the vaccine. Spray-Vac was designed to allow producers the simplicity of spraying their vaccines without the massive cost and inconvenience of using distilled water – making it the one of the most powerful products available for protecting your valuable vaccines. It provides the ultimate in stabilization, including new generation stabilizer formula especially engineered for poultry spray vaccines, including fragile bronchitis and mycoplasma vaccines. For more information on Spray-Vac, download the spec sheet below. You can also download the full ASP Family of Vaccine Stabilizers brochure by clicking on the icon to the right or below.